Once a monoclonal protein has been identified in a serum sample, it is recommended that total immunoglobulins (IgG, IgA and IgM) are also measured by nephelometric/turbidimetric methods . Whilst it is preferred that monoclonal proteins are monitored by densitometric quantification, in cases where small monoclonal proteins are obscured by other serum proteins (e.g. transferrin), nephelometric measurements may be more accurate . However, total nephelometric measurements cannot discriminate between monoclonal and polyclonal immunoglobulins, which may limit their usefulness as the serum concentration approaches the normal range . In their study of 149 patients with IgA MM, Katzmann et al. showed that total IgA assays are less sensitive than IgA Hevylite assays for detection of monoclonal IgA in diagnostic and post-treatment samples (Table 4.4). It is important that densitometric and nephelometric methods are not used interchangeably as they do not always yield the same result . For example, nephelometry may overestimate high concentrations of monoclonal IgM, and will also overestimate monoclonal protein concentrations if samples contain significant levels of polyclonal immunoglobulin. Electrophoresis may underestimate high concentrations of IgG (possibly due to dye saturation, Section 17.5). Figure 4.5. 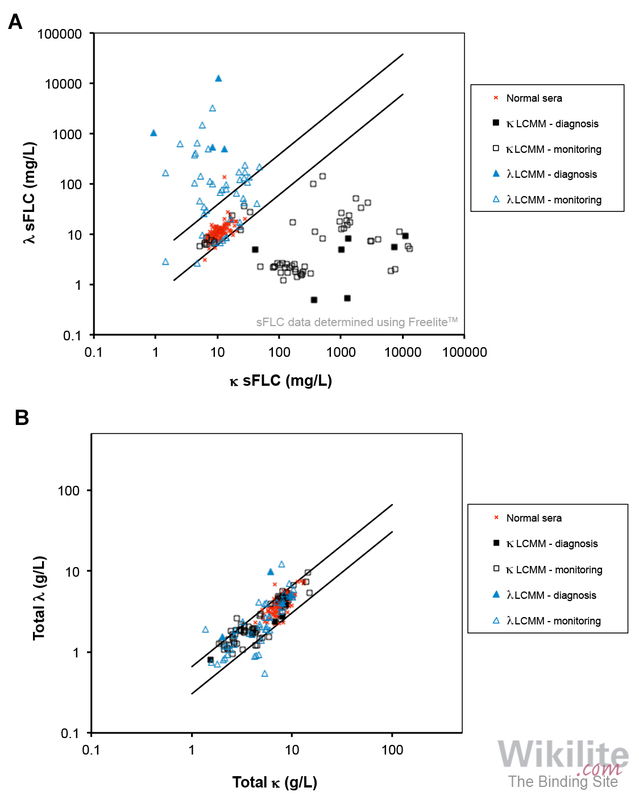 (A) sFLC and (B) total light chain assays results for 114 patients with LCMM. Figure 4.6. Comparison of (A) total serum light chains and (B) sFLC κ/λ ratios for identifying patients with κ and λ LCMM. κ patients: black squares; λ patients: blue triangles. The red triangle is a mistyped sample. Normal range limits are shown. Nephelometric total light chain assays measure the concentration of all intact immunoglobulin and FLCs of a particular light chain type (e.g. total κ assays measure IgGκ + IgAκ + IgMκ + IgDκ + IgEκ + κ sFLCs). Results are expressed as a κ/λ ratio and are used by some laboratories as a screen for monoclonal gammopathy. However, it is an insensitive approach. The presence of background polyclonal immunoglobulins prevents the detection of monoclonal proteins smaller than around 4 g/L . In the largest study to date, Hungria et al. compared the diagnostic sensitivity of Freelite sFLC assays and total κ and λ assays (Beckman Coulter) in 114 patients with light chain MM (LCMM). At diagnosis, the sFLC assay identified clonality in 11/11 samples, compared to 2/11 for the total light chain assay (Figure 4.5). During follow-up, an abnormal κ/λ sFLC ratio indicated monoclonal sFLCs in 80/103 samples, compared to 25/103 for the total light chain assay (Figure 4.5). Confusingly, the total light chain assay misreported the monoclonal light chain type in 11 samples. Marien et al. compared the diagnostic performance of the sFLC and total light chain assays using sera from 16 LCMM patients. All samples were abnormal by sFLC assays (Figure 4.6). This compared with only five of the 16 samples by total κ and λ assays, and one λ patient was mistyped as κ. Other studies have confirmed that total light chain assays are less sensitive than sFLC analysis for the diagnosis of LCMM, nonsecretory MM (NSMM) and AL amyloidosis  and for screening for MM . Thus, the benefits of the total κ/λ assays are limited, and they are not recommended by international guidelines (Chapter 25) .